My 5 yr old Yorkie, has gained a little weight, eating too many “cookies” …as rewards. 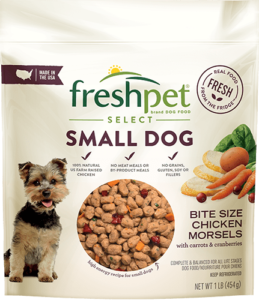 I purchased Freshpet food to give her, instead of all the treats. She loves it…and on occasion, I give her a serving for a meal. She gobbles it up. She loves this stuff! I wish I could afford to feed her only this food, but with multiple dogs in house, no possible. She will continue to get this food as her “reward” each day! Highly recommend this product!